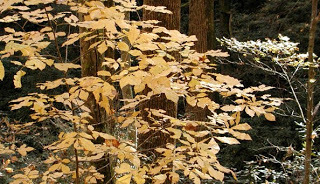 This final fall color report for our area of the North Carolina mountains brings us to the end of the leaf peeping season at our elevation (2,300), where the fall colors are fading fast. 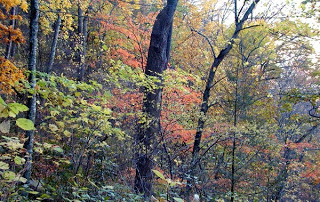 Late-changing oaks and maples are doing much of the work now, albeit we still see some yellows, like the tree above. Evidence of the fall foliage season finale in our neck of the woods: the leaves now make that fantastic crunching sound under your feet. 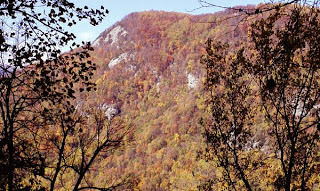 The sun shining on the copper-tinted ridge above our apple orchard this morning was beautiful and we knew we wanted to get out and see more fall foliage, so we headed 30 minutes south, to Chimney Rock Park, where the fall colors are most brilliant later in the season. 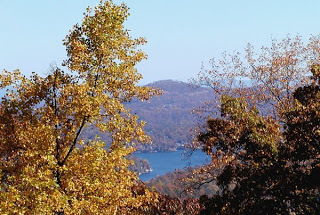 Elevations vary from somewhere around 1,000 feet to the highest point — the appropriately-named Exclamation Point — 2,480 feet. One item to note: the elevator to the Chimney is undergoing improvements and is currently closed as of November 2. 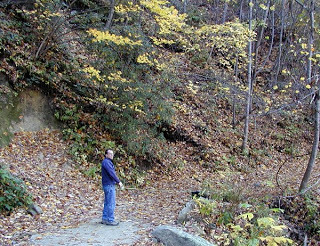 You can access the Chimney via the Outcroppings trail, a set of stairs and boardwalks with unique points of interest along the way. 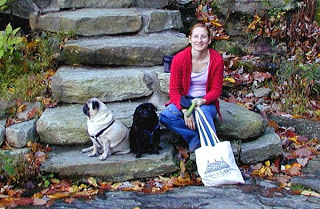 Since the innpugs were with us, namely, Csaba “I don’t do stairs” Pugga, we decided to take the Hickory Nut Falls trail to the bottom of the falls. 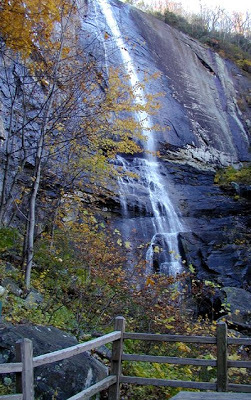 The Hickory Nut Falls trail is 1.5 miles (roundtrip) and leads to the foot of a 404-foot waterfall. 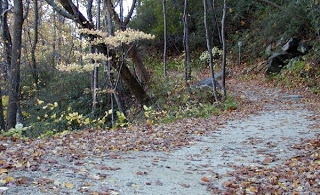 The well marked trail through hardwood forests surrounded by cool rock formations is perfect for people and pugs. 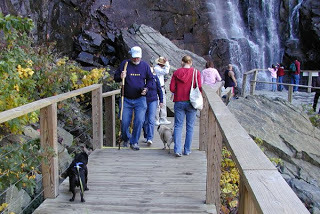 After a leisurely hike of three-quarters of a mile, we made it to the bridge that leads to the base of Hickory Nut Falls. 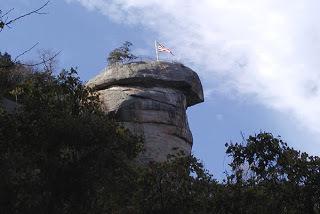 Looking up over 400 feet along the enormously-wide rock wall to the top of Hickory Nut Falls, we remembered that large portions of scenes from Last of the Mohicans were filmed here, including the last half hour of the movie, right along this area. We can see why someone would want to shoot a movie here…it’s picture perfect.